Economic prosperity, an aging population and stark gender imbalance have combined to turn Korea into a major destination for Asian migrants. But Asia’s fourth-largest economy appears to lack institutional systems to keep pace with the change. Its policies on immigration and expatriates are hamstrung by short-sighted vision, fragmented policymaking and a dearth of leadership and commitment in officialdom. Several years after it started a multicultural policy in earnest, the government still lacks a control tower to coordinate and monitor policies. Several government bodies are involved in multicultural affairs, often leading to bureaucratic inertia, overlapped responsibility and squandered resources, critics said. Despite much-touted government campaigns, discrimination and biases are widespread in society and public awareness of the need for greater appreciation and inclusiveness remains low. “One of the biggest problems is that ministries remain scattered and together deal with various groups of immigrants such as marriage migrants, laborers or international students, resulting in poor coordination,” Julia Jiwon Shin, a research fellow at the IOM Migration Research & Training Center, told The Korea Herald. In line with a steady rise in the number of foreign residents, the mainstay of policy discourse has shifted from whether to accept migrants to how best to accommodate them, she noted. Currently, the country’s immigrant policy is dealt with mostly by three pan-governmental committees under the Prime Minister’s Office, each in charge of foreign residents, labor and multicultural families. They map out basic policy guidelines every five years and deliberate and fine-tune the existing and new policies through consultations with related ministries and agencies. But critics point out that their road maps result from simply piecing together the sometimes conflicting needs and suggestions of those affected. The Committee for Foreign Resident Policy, for instance, was set up in 2006, chaired by the prime minister and consisting of 17 top government policymakers and seven experts and civil society leaders. In its second, five-year basic plan unveiled late November, the group set five goals and 146 subtasks to be executed by 2017. They are: economic vitalization and securing talent; social integration by common values; discrimination prevention and respect for cultural diversity; safe society for all; co-prosperity with the international community. The ambitious scheme, however, apparently falls far short on crucial mechanisms for legislation, research and monitoring. In addition, most of its objectives overlap with those laid out by the other two panels ― the Foreign Workforce Policy Committee and the Multicultural Family Policy Committee. “They are all immigrants and we are looking at them from very different ways. And in some ways, if you look at all the plans, if you compare them, they are all linked,” Rep. Jasmine Lee of the ruling Saenuri Party said in a recent interview with The Korea Herald. A Filipino-born marriage immigrant herself, Lee has been calling for the establishment of a control tower since becoming the country’s first naturalized lawmaker last year. As a new immigration bureau seems a distant reality for now, an office incorporating the three groups may be one answer to the ongoing fragmentation, she said. “That’s one thing because all of them don’t really have any offices. They are just a group of people, meeting once or twice a year,” Lee added. To that end, she urged a revision of key relevant laws so as to codify the fact that Korea is an “immigrant country,” which will pave the way for a state agency eventually. Such an integrated channel will help not only streamline policy planning but build a due legislative and regulatory framework, experts say. The Employment of Foreign Workers Act took effect in 2004 as the country’s first immigrant-related law, along with the Employment Permit System. But the license scheme triggered controversy largely for the clause requiring foreign workers to return home after three years and come back in one month before renewing their visas, resulting in a massive throng of unregistered laborers. The government then drew fierce protests from labor and human rights groups after arresting some 10,000 people in a sweeping crackdown on illegal foreign workers in 2007. A 2009 amendment enabled foreign employees to extend their permits by up to two years and eased rules on workplace changes. 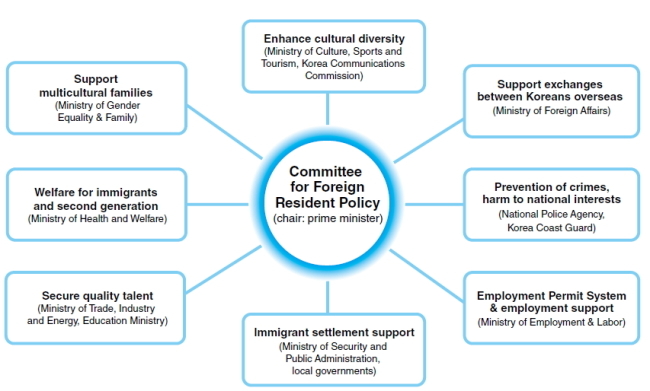 The more far-reaching Basic Law on the Treatment of Foreign Residents in Korea was enacted in 2007, followed by the 2008 Multicultural Family Support Act and other more substantive, demand-driven legislation. The basic law was designed to ensure discrimination prevention, rights protection and welfare for not only laborers but also for skilled manpower, marriage migrants, permanent residents such as through investment, and even refugees. In a watershed move, the government in 2010 began granting permanent residency to foreigners who invest $500,000 or more in property on Jeju Island and live there for at least five years. As of the end of January, the resort island has lured more than $230 billion won ($206.7 million) in 352 cases, chiefly from Chinese investors, according to the Justice Ministry. The investor immigrant program has since then expanded to other regions such as some parts of Busan, Incheon, Yeosu and Pyeongchang, but has had little effect so far. In another development, the National Assembly passed Asia’s first standalone refugee act last year, which will come into force in July. It governs the application for refugee status and social security, assistance, education and other benefits. Since Korea adopted the 1951 Refugee Convention in 1992, more than 5,160 people have applied for the status, about 1,140 of them last year. Despite a lack of details and criticism over its narrow definition of refugee status, the landmark law marked a “major step forward” in terms of refugee policy, Shin of the IOM think tank said. “The independent legislation is also in line with the recommendations from the international community,” she added. The recent legislative progress coincides with a sharp increase in the number of foreigners in Korea, which topped 1.5 million last year, up a whopping 50 percent from 2007, government data shows. About 44 percent of them are migrant workers mainly from China and nearly 30 percent have come through marriage from countries including Vietnam and the Philippines. Together they now make up about 2.5 percent of the population. In a related effort, law professors are launching a society dedicated to research in immigration rules on May 31, which will be headed by Kim Hae-ryong, vice president and a law professor at Hankuk University of Foreign Studies in Seoul. Despite improvements, Korea has a long way to go to advance relevant laws and regulations to a global level, he said. “Consolidating government policies into the legal frame is another pressing task at which from a professional point of view the committees are somewhat weak,” Kim said. To better manage the gushing inflow of foreigners, experts call for more vigorous, open discussions over immigrant policy and a multicultural Korea, as well as reinforced public diplomacy and know-how exchanges with other countries. Kim Woo-sang, a former president of the Korea Foundation and former professor at Yonsei University, picked open intellectual communication and knowledge and experience sharing as key to a successful immigration policy. “Accommodation and integration of intercultural differences into national, regional, and global communities is no less serious policy challenge many of us are facing in different parts of the globe,” he told a multiculture forum hosted by the state public diplomacy institute late last year.